Encounter reading: fast, slow, close, automatic, systematic, extra. Other texts online as assigned or recommended. Bring a computer or tablet to class each week. Read: Chapters or articles in the text. Read: The literary works referred to, online or by download. Search: Terms, names, movements you're not familiar with. Google. Make Notes: Draft a couple pages of notes addressing the current reading and previous discussions. Make this public thinking. Questions for debate and consideration. Public: Meet M 4:00 - 6:40 to discuss, practice, question, review, reveal, read in collective. Seminar stuff. More note taking. Googling. Revise and append notes, re-read, re-think, re-consider, re-tell. Create your own database. Transcription. Spolier. Thank yous to Jessica at UCLA whoever she might be. (ahem). 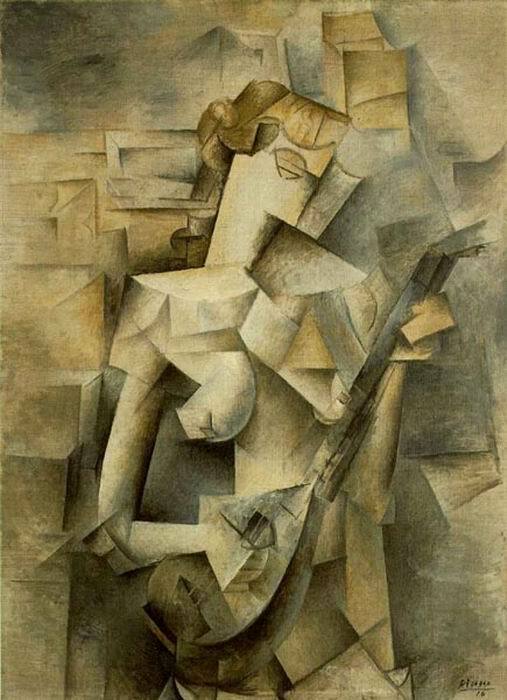 Violin and Glass, Braque, 1913: "Violin and Glass (1913) reflects the culmination of Braque’s interest in simultaneous perspective and geometric forms, ideas he cultivated while working side by side with Picasso. 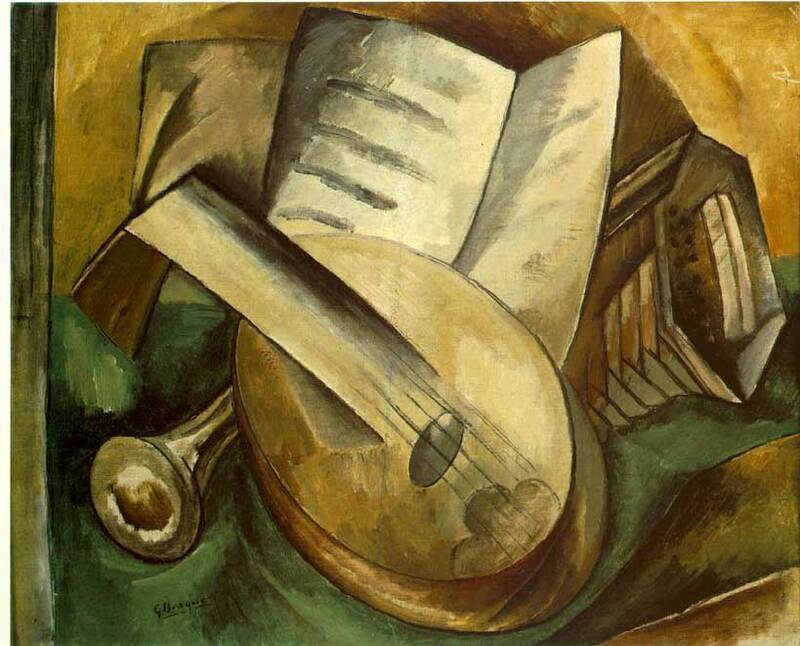 Braque’s close collaboration with the artist was fruitful but brief, lasting only until 1914, when the French painter decided to go to the trenches, fighting for his country during W.W.I." Pressman, chap 4. Read The Jew's Daughter, and anything else that needs reading. Ithaca PDF or text. Ulysses, 1922 edition, at U Victoria. If you haven't, start to read afternoon: a story, to get a sense of what first-generation hypertext was about. Read the directions. Don't be fooled by the naive look of the text. afternoon is sophisticated hypertext narrative. Read Chroma. In 3 - 5 minute chapters. Visit the Only Revolutions site. It has something in common with the digi lit we've been reading. The forums (a database) are interesting in that readers are sharing reading strategies. A few images of Only Revolutions, here. Update 22 Feb 2015: Class cancelled for 23 Feb. Use the time to read-review and research-update. Update on reading digital literature: If your computer slows down or the fans come on when you're reading some of the literature, it's benign. Some Flash productions demand a lot of computing power. Bear with it. Be patient. There's nothing wrong. Wardrip-Fruin, "Five Elements of Digital Literature." Zuern, "Figures in the Interface." Touching Words, Talan Memmott and others discuss aesthetics at the Bristol docklands. Rudy Lemcke, The Uninvited and other video work. Stories Beneath Your Feet. Lecture. Stories Beneath Your Feet and Fingertips: Playing Locative Stories by Kathi Inman Berens. These Waves of Girls. Multimedial hyperfiction. this sea is nothing in sight but isles.A demonstration of procedural processing. READWRITEGARDEN.PDF. Carpenter walks through a procedural poetry generator. These Wavs of Memories, Koskimaa. Example of how digital literary criticism proceeds. "The challenge for e-lit criticism, posed by works like These Waves of Girls, is thus to combine all the complexity of literary criticism with all the complexities hyper and cybertextual programming creates, without reducing the work to only one of its multiple dimensions." Procedural Literacy: Educating the New Media Practitioner, Michael Mateas. What the professional reader needs to know. See also Wardrip-Fruin, "Learning to Read Digital Literature." A critique of procedural poetry. Poetweet. Poetry generator from twitter streams, with procedural process parody. Because procedural poetry isn't real. Saemmer, "Digital Literature - A Question of Style." Goicoechea, "The Reader in Cyberspace." Strehovec, "Alphabet on the Move." Crowds and Power Some links seem to create new browser windows. TheHouse, Flanagan. "As in much of electronic literature, the experience of the work as an intimate, interactive, screen-based piece is essential to understanding and appreciating it. Indeed, the work is only realized through user interaction and navigation. How does everyday spatial practice bring into focus the relationship between code, language, and relationships? What are the key characteristics of digital relationships as seen through this light? Does the recurring emphasis on process, chance, and interactivity also function as an indicator of larger questions about the chance writing of the text? The poem presented is autobiographical in nature yet engages the conceptualization of both language and embodiment as the text creates its own types of organism."